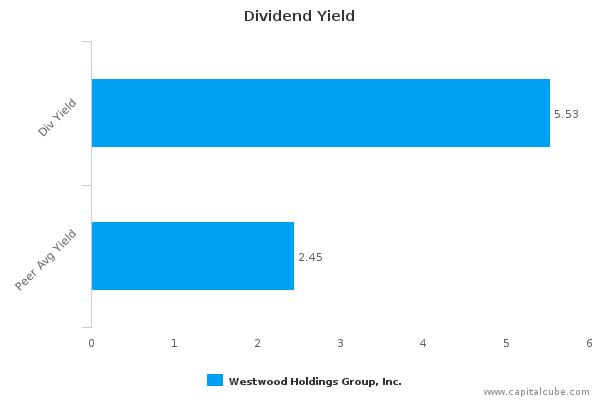 I have selected Westwood Holding Group, WHG, for inclusion in my 2017 M* MoneyMadam Dividend Machine Portfolio. 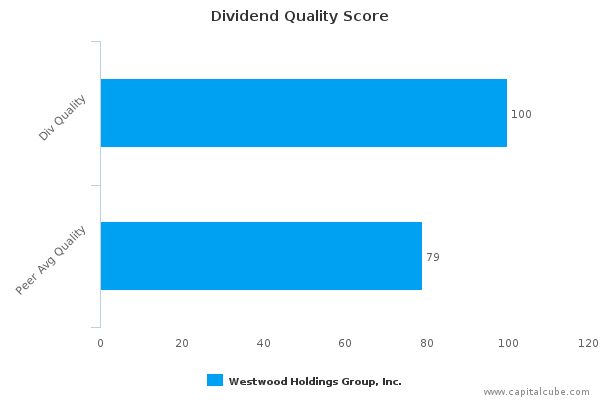 Before I left on vacation, I targeted Westwood Holding Group, symbol WHG, for inclusion in my 2017 portfolio, however, I had not completed my review and waited until I returned to write up this story. During that 2 weeks, the stock price moved from $55.77 to $57.06. In July 2002, Westwood went public under the symbol WHG. They are global asset managers, serving institutional investors as well as private wealth investors and they serve as financial intermediaries with $22.1 billion of assets under management. Notice the significant stock price deterioration in 2016 when the fiduciary rule announcement affected all asset managers. As institutional investors, they provide large amounts of money that can be used by companies to raise capital. They do not accept deposits from individuals as a bank does. For their private wealth customers, WHG delivers financial planning, portfolio management, and other aggregated financial services. They are multi-licensed portfolio managers. As financial intermediaries, they can provide factoring, leasing and insurance plans although WHG does not provide leasing and insurance. WHG specifically provides mutual funds and MLP’s and other investment products. While “active” management is out of favor today, WHG is an active manager. Wealthy people do not put their money in just SPY. Wealth accumulation comes with complexity and it takes a team like WHG to work through all those externalities to make sense of significant wealth. These services are not cheap. WHG does not divulge their fees on their website. In their April 26, 2017 press release, WHG indicates they received performance-based fees of $0.4 million during the first quarter of 2017 alone. I am an income investor and while I try not to chase yield, I expect my stock picks to deliver more income than I can get from a 10 year U.S. Treasury. I expect my income to grow faster than inflation and I want a solid company that is not at risk of default due to a bad balance sheet or a change in some momentum catalyst. The table below summarizes how WHG scores on the criteria I use. Note that I don’t require covered call options for a stock to be part of my model portfolios, but with low dividend stocks I do like to have the call option potential. WHG has a mid 4% yield and that is good enough to mitigate the call option hurdle. When I looked back to 2011 when WHG was a Dividend Machine, I notice that the stock price has increased nicely from $37.65 to $57.06. Click here to review the 2011 post on WHG. The dividend has grown as expected from $1.40 to $2.48. In 2015 WHG again met all my criteria for a Dividend Machine. In that post WHG's price was $57.15 so no growth since then. More significant is their EPS are less than they were in 2015. Click here to review the 2015 post on WHG. This requires more inquiry. 2016 shows a distinct slowdown in growth and their internal documents tell us that resulted from a reduction in assets under management (aum) as well as reduced asset performance. I looked more closely and the table below shows their most recent report regarding revenues, assets under management and net income. From Westwood 10-K filing Feb 2013. “Our business is dependent on investment advisory, sub advisory and trust agreements that are subject to termination or non-renewal. As a result, we could lose any of our clients on very short notice. I looked back at how the dividend held up during the significant financial crisis of 2009. After increasing the quarterly dividend from $.25 to $.30 in February 2008, they held that dividend steady until the next increase. In October 2009, the quarterly dividend increased from $.30 to $.33. Considering how disruptive this period was, I find it encouraging that WHG was able to maintain their dividend. WHG is not sitting on their hands doing nothing. They have acquired other entities to shore up their business. These acquisitions include: McCarthy Group Advisers in 2010, in 2015 Woodway Financial Advisors in Houston added to their private wealth platform, and in 2017 they bought a significant part of Hudson Pacific Properties. I feel better about their recent performance but as an income investor I concentrate on that dividend. Their payout ratio is pretty high and I turned to “Dividend Score.com” to see what their analysis revealed. The charts below present their analysis. In summary, WHG is a success story that John Wooden would be proud of. Taking a position in WHG should provide a good dividend stream and dividend growth. Stock price growth may be stagnant while we work through the fiduciary rule, but WHG continues to grow their business and I am hoping it will fit nicely in the 2017 Dividend Machine Portfolio.